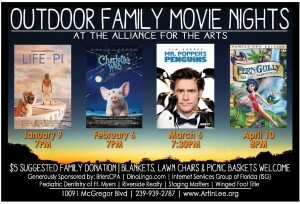 FORT MYERS, Fla. (December 3, 2014) – Pediatric Dentistry of Ft. Myers, Dr. Tim Verwest, DMD will sponsor outdoor family movie nights at the Alliance for the Arts for the 2015 season. All funds collected go to support the children programming at the Alliance for the Arts. Family movie night at the Alliance for the Arts begins Friday, January 9 at 7PM with a screening of The Life of Pi. “It’s a great way for us to show our community involvement and partner with a great local children’s organization,” said Dr. Tim Verwest, DMD of Pediatric Dentistry of Ft. Myers. The series continues Friday, February 6 at 7PM with Charlotte’s Web, Friday, March 6 at 7:30PM with Mr. Popper’s Penguins, and concludes on Friday April 10 at 8PM with Fern Gully: The Last Rainforest.